"Uluwatu Temple is located at the southernmost tip of Bali. We hopped on a cab who agreed to bring us to Uluwatu, dinner at Jimbaran and back to Kuta for Rp250, 000. Entering into the temple will cost you Rp15,000 and you will be given sarong and sash if you're wearing shorts. Anything below the knee is fine. In the temple you will find monkeys, monkeys and more monkeys. These are extremely aggressive monkeys who will grab anything even non food items like hats, towels, toys, camera. Hold on to your things very tight because once they get it, that's the end of it. The temple is breathtakingly located on a cliff plunging down to the sea. Very beautiful and very dangerous. Please don't go beyond the walls. 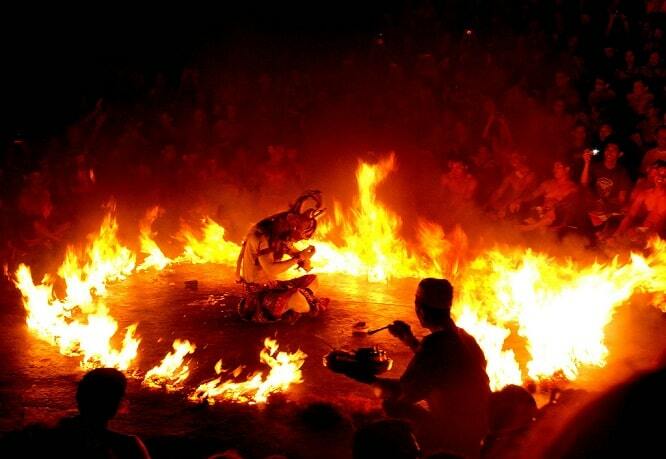 The must do here is to watch the Kecak & Fire dance." No visit to Bali would be complete without seeing some of the island's colourful traditional Kecak Dance. The Kecak dance is also called �the monkey chanting dance�, and was created around 1930. Now it's internationally recognised as one of Bali�s top-three signature dances (along with Barong Dance) It steals the show and is unique in that it has no other musical background but the chanting of a male chorus intoning a �keh-chack� sound during most of the performance. Kecak�s storyline is taken from the Ramayana Hindu epic and it�s on the entertainment schedule of almost every Balinese arts and culture venue. Kecak is also known as the Ramayana Monkey Chant, the piece, performed by a circle of at least 150 performers wearing checked cloth around their waists, percussively chanting "cak" and moving their hands and arms, depicts a battle from the Ramayana. The monkey-like Vanara helped Prince Rama fight the evil King Ravana. Kecak has roots in sanghyang, a trance-inducing exorcism dance. The story is a fragment from the Ramayana, the Hindu epic which finds its expression in many forms, not only in dance, but also in painting and carving. Prince Rama, heir to the throne of the kingdom of Ayodya, and his wife Sita have been banished from the kingdom by King Dasarata as a result of trickery by Rama�s stepmother. 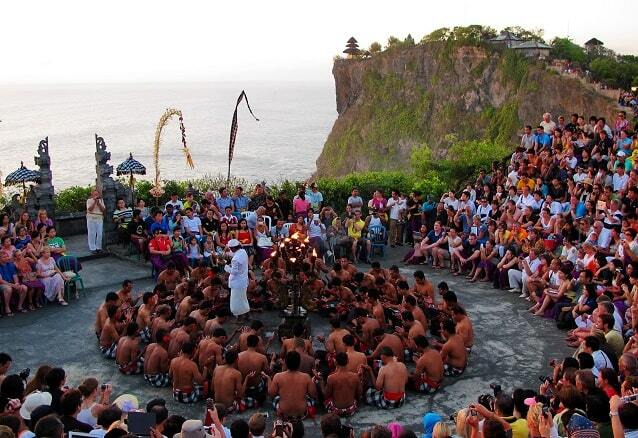 The Kecak Dance is performed nightly from 6:30 to 7:30 in areas of Ubud, Batubulan Village in Sukawati and at Uluwatu Temple in Uluwatu South Bali. Price of admission of a Kecak Dance is about 100,000 Rupiah Per Person. De Kecak dans wordt vaak uitgevoerd terwijl de zon onder gaat, en afgesloten met de vuurdans. Het licht van de fakkels werpt lange schaduwen over het publiek, terwijl Hanuman zich opmaakt voor zijn spectaculaire afsluiting.